Shana Burton and Kayla Kennedy's experiment gauged the evaporation rates of water. Students across Cannon County benefited from hands-on experience with the scientific method as part of the elementary school science fair. "We basically each picked something we wanted to learn more about and then did the experiment," explains Diaper Challenge designer Alayna Reed. Projects ranged from electrical experiments to food preservation to probability studies. One project by Sydney Foster and Dustin Hutchins even tested the strength of various flammable liquids and gasses as potato-propellant in their homebuilt PVC gun. Auburntown student Shana Burton says "we learned about the scientific method last year but this time we really went through it and did all the steps." Her partner Kayla Kennedy was excited about how much she'd learned form the other students projects, "I didn't know anything about strawberry DNA before... It was just something you'd eat!" 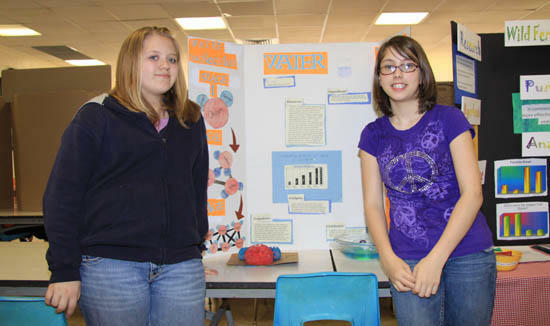 Finalists from the Cannon County Science Fair will advance to district competition. Sydney Foster and Dustin Hutchins experimented with different combustible liquids as fuel for their homebuilt potato gun. Alayna Reed's experiment (left) revealed the quality of Pamper's brand diapers and Kristin Garrison's (right) showed that more megapixels don't necessarily mean a better picture. Hunter Vickers' project generated crystals from different water-based solutions. Brandond Harper explains his probability-based project to judge Joel Schrenk.